The rugged convoluted coastline of Argyll plays host to some of the most dramatic and diverse marine habitats in the UK, powerful tidal currents, deep waters, sheltered lochs and bays all contribute to an exceptionally rich marine biodiversity. 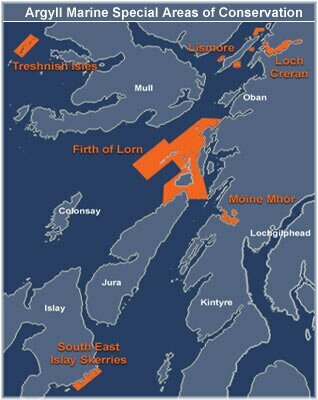 There are six marine Special Areas of Conservation (SACs) in Argyll: the Firth of Lorn, Loch Creran, Treshnish Isles, Lismore, South-East Islay Skerries and Mòine Mhór. Argyll and Bute Council have taken the lead on the management of Loch Creran and the Firth of Lorn. Management of the other sites may be considered in the future. Argyll and Bute Council have established the Argyll Marine Natura Project in partnership with Scottish Natural Heritage with supporting funds from West Highland European Leader Kist/Leader +.